Apple took its latest "Start something new" Internet ad campaign global on Wednesday, highlighting digital works of art created through a synergy of iOS and Mac hardware and third-party software. 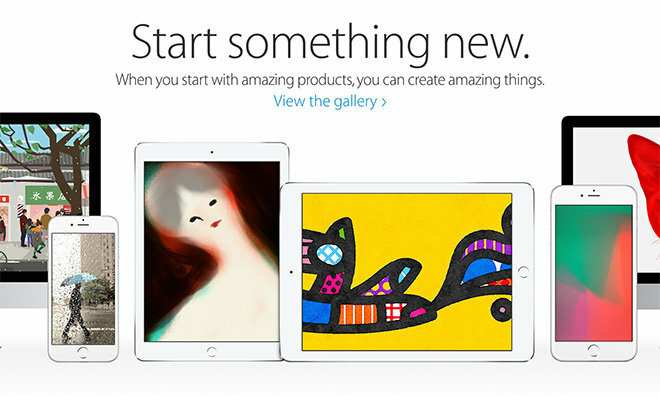 Prominently displayed on Apple's official website in the U.S. and beyond, "Start something new" is an online art gallery showcasing the potential of Apple products. Apple first launched the project on its Japan website last week. Every piece in this gallery was created on an Apple product. Every brushstroke, every pixel, and every frame of film was brought to life by talented Apple users from around the world. As you explore their work, we hope it inspires you to create something new. Featured artists include Austin Mann, who illustrated the photographic potential of Apple's iPhone 6 and 6 Plus through haunting images of a stark Icelandic landscape. To achieve such stunning results, Mann combined stock hardware and third-party photography app VSCO Cam. Other photographers featured in the gallery —Marcelo Gomes, Christian Weber, Jared Chambers, Alistair Taylor-Young, Chad Riley and Jimmy Chin —applied a variety of techniques to extract high quality images from iPhone and iPad that rival comparable pictures shot on standalone camera systems. Aside from VSCO Cam, Apple touts the capabilities of its own Camera app, like Burst Mode, Panorama and more. Illustration seems to be a focus for Apple's featured iPad artists, as seen in Nomoco's ethereal portraits created using Brushes 3 on an iPad Air 2. An interesting piece by artistic duo Craig & Karl came to life through collaboration over FaceTime and iMessage and ultimately accomplished using painting app Waterlogue. Filmmakers are also included in the "Start something new" gallery. Universal Everything's Matt Pyke used his iPhone 6 to capture high contrast moving images, then tweaked speed, color and other settings to end up with a film bearing almost painterly qualities. Finally, a peppering of Mac creatives showed off paintings and movies produced on iMac using iDraw and Final Cut Pro.